I’ve been hanging around in the writing world for twelve years, since I was fourteen. That’s when I bought my first book about writing, and when I first went to a writers’ group. Lots of things which we pretty much take for granted now – like home broadband, blogs, Google and PayPal – were in their infancy. Lulu (2002), Skype (2003), Facebook (2004), YouTube (2005), Twitter (2006) and the Kindle (2007) didn’t exist. And that means that the nature of writing and publishing has changed too. In all my time reading about writing and going to writers’ groups, self-publishing has been looked down on – either explicitly or implicitly. Poor jacket design and interior layout. Tons of typos and other basic mistakes. They didn’t look professional. And, judging by the content, they’d been self-published for a pretty obvious reason. They weren’t good enough for anyone but the author to think they were worth publishing. I wish this wasn’t true, but it is. Around the same time, I read the book Shadowmancer by G.P. Taylor (which was initially self-published, then taken up by a mainstream publisher). It’s a good story – but it could’ve done with a lot more editing. There were clumsy passages of writing that any critique group would’ve picked up. I realised that self-publishing had earned its stigma. And I told myself that I wasn’t going to self-publish my work. Ever. Because, even if I managed to make it really good without the help of an agent or editor, it would be tarred with the same brush as all the crap out there. In my little corner of the blogosphere, no-one talks about self-publishing. They don’t even necessarily talk about books. They talk about information products and releasing and launching. No-one, no-one, has ever told me that they weren’t going to buy one of the Blogger’s Guides because they were “self published” ebooks. For months, since I finished my Masters in Creative Writing, and finished the third draft of my novel Lycopolis, I’ve been wondering what the heck to do with it. Should I find an agent? (And was it all a waste of time if I don’t?) Or should I go it alone? I’ve realised that a heck of a lot of authors are self-publishing their books, with some amazing results. With Kindle ebook sales overtaking print sales last year, ebooks have finally become mainstream. And on the Kindle, self-published authors are often outselling traditionally-published ones. The first-time novelists are doing it. Why? Because, as Jennifer Hudock points out, it gives them control over their work – and the stigma is slowly going. The seasoned pros are doing it. Why? Because, as J.A. Konrath points out, they make much more money from their ebooks that way. And why “indie” publishing? To emphasise the similarity to being an indie band or indie film-maker, neither of which are seen as a bad thing. She got feedback from “beta readers” and incorporated it into the redraft of Pentecost. She made a book trailer (which you can watch here). She paid for promotion on Kindle Nation Daily. In short, she did all the sorts of things that a “real” publisher would do. She treated her work like a professional. She put her money on the line. She used her existing blog platform to launch her work. If you’re going to be an indie publisher, that’s how it should be done. Today, indie publishers have access to the exact same space on Amazon as traditional ones. Today, indie publishers can find freelancers online who’ll do editing, proofreading, cover design, layout, and more. Eleven years ago, it was obvious that self-publishing was a last-resort, to be considered only when you’d finished papering your garret with rejection letters. In eleven years time, it might be obvious that indie publishing is the way to go – especially for authors who’ve build up a strong online audience, and who want full control over their projects. Plus, print on demand will probably keep getting cheaper, easier and more accessible. You’ve got the support of an agent (probably) and an editor. All your friends and family will be excited for you (rather than thinking you’re a bit crazy)/. On the other hand, publishing budgets are tight, and – in almost all cases – authors are very much expected to do their own promotion (with social media becoming more and more popular). You get all the profits – not just 10-15% in royalties. You can price your ebooks low in order to sell larger volumes (Stephen Leather’s ebooks sell for $0.99 each) – and you can use print-on-demand companies to produce hardback or paperback versions at a fairly reasonable price. Neither is better any more. And in case you’re wondering, yes, I’m thinking about indie-publishing my novel. I’m going to be heading to some sessions at South by South West interactive on publishing-related topics, and I’ll be making a decision (and posting about it!) after that. Whether you’re a writer or a reader, I’d love to hear your views on this post. Are indie publishers finally making self-publishing an acceptable choice? Would you buy an “indie” book or ebook? I personally don’t even look how a book is published (self-published, by a publishing house, whatever). I buy based on recommendations from people I trust (or from a large-ish amount of people I don’t know). The last time I did that was a few months ago with the Mistborn series of books, and the whole trilogy turned out to be some of the best books I’ve ever read. I’ve noticed that I *very* rarely know the publisher of any book – even for series where I’m actively anticipating new books. What I care about is the author! And yeah, like you, I tend to go based on friends’ recommendations – or sometimes I just come across interesting book links online. I have some of the same reservations as you about self-publishing, since as you said, self-published books used to be really terrible. But now, as a reader I actually prefer to buy as directly from the author as possible. It’s important to me to financially support the people who created books that I enjoy. I buy self-published infoproducts, why not fiction? I decide what to buy based on things like reputation, what I know about the author (e.g. I’d be more likely to buy your book because I like your blog) and the opinions of people I trust, not who published the book. I think this is going to become more and more true in the future as indie publishing and ebooks become more and more mainstream. I’m having the same sorts of feelings, Christina; if some of my favourite “mainstream” authors had their books available direct, I’d buy straight from then! And like you, trusting people definitely comes into it – especially when I’m investing in non-fiction ebooks (the “info product” end of the market). I love the self publishing concept, particularly as it relates to ebooks. Fortunately, the ebook reading experience is starting to gain some crossover appeal with readers, which means people can enjoy ebooks like paper books and production/delivery costs are insanely low. The key, as you said, is quality. Treating it like releasing a regular book instead of treating it like posting a blog post is what makes the difference. The more writers you see doing that, the better. I hope to join that crowd soon! I have to say, I’ve bought some lousy traditionally published books and some amazing indie published books. I see what you mean about how it used to be, but I see the scales as balanced. If the book is good, regardless of how it came to be. I can’t say that I really pay much attention to publishing. As noted above, the author is who matters to me. I think publishing your own book, indie style, just sounds like a big, cool, awesome adventure! You’re right Ali, the world has changed and I think we’re only seeing the beginning of the how fast ebooks are changing the publishing world. I think the traditional publishing industry is going to go through a huge metamorphosis in the coming years just like the music biz. If you self publish not only do you have to be the author, but take on the publishers role as well. It’s a lot of work. but I believe that if you put out the best book you can…you can develop a following, and then maybe get noticed by an agent if the sales are there. I would read your book! but if it wasn’t for blogging I would have never known you’d written one unless you published it through traditional channels. What a wonderful platform blogging is for writers. I have nothing at all against traditional publishing – I’ve met quite a few agents and publishers over the years (at writing conferences and while I was a student at Cambridge and at Goldsmiths) – and without exception, they’ve been lovely people. And good point that you (and many other folks!) wouldn’t know me if it wasn’t for blogging… it is indeed a fantastic platform – and a whole lot of fun! I’m so pleased to hear that you are inspired by the indie ventures of authors at all different levels of success! One of the other posts you should read is the Time vs Money post JA Konrath recently put up. It reflected on the time to market between trad and indie – 12- 24 months vs. 24 HOURS to publish on the Kindle and how much money you’d be losing out on if you went with trad publishing. I love the speed to market, the control and feedback you get as an indie. It was great fun to indie publish Pentecost and I’m writing the next one Prophecy at the moment. That said, I also went the indie route as I prefer to attract attention than beg at the agents/publishers very crowded slush pile. There are authors who have got print book deals via excellent Kindle sales, and I would weigh that up if the opportunity arose…although Amanda Hocking’s numbers give one pause! Something else to add to the mix. 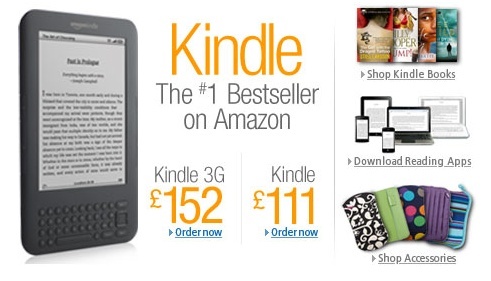 There are rumours that the Kindle will be free by the end of 2011 based on a book club style model i.e. free Kindle but you buy 4-5 ebooks a month (at 99c each for indie books, it’s a steal!) If that happens, expect 2012 to be huge for ebook sales and indie authors to be in the frontline of reaping benefits. Very low overheads, high margins with 70% royalty rates from Amazon. The times have changed, and the pace of change is only accelerating! It would be great to see you on the indie train Ali! When we had agents in at Goldsmiths (I did a Masters in Creative Writing there), I asked about self-publishing work online/as ebooks/etc and they all seemed very positive about it. Five years ago, the advice was all “don’t do it, no-one will touch it if it’s already been released in any form” — but that’s clearly changed fast. Really interesting to hear that about the Kindle! The price point strikes me as just a little high to encourage mainstream takeup right now … you need to be techy enough to risk giving it a go, or you need to at least know people who’ve got one. I’m totally with you, Ali! I think the main thing is, like you mention, all in the promotion. People expect to just put it out there, kick back, and make sales (something like the way some people treat information products!). You’ve got to market it and put it out there. Anyways, I think indie publishing is totally changing the face of things, I freakin’ LOVE my Kindle (even for reading “information product” type ebooks, I hate reading long documents on the computer), and I can’t wait to see where things go from here! I love my Kindle too – I actually wish more info products were done in a more-easily compatible format (and this is something I’m thinking about doing with my own). PDFs are usually a pain to read cos they’re too small on the Kindle (even though I have a BIG Kindle!) — and if I convert them into the Amazon format, they tend to lose some formatting and go a bit weird looking. And yeah, totally with you regarding marketing and promotion! YES YES YES. I have a Kobo, and I ADORE it. It is SO nice to be able to read books in large print, or to not have to hold books up to my nose to read them – that whole blind thing is a bit of a drag. Sometimes my husband finds me on the bed with a book resting on my nose. That’s a very important part of e-publishing for me – it brings books and information to a whole range of people who wouldn’t normally have access to them. But yeah, PDFs urgh. SO tiny. The dude over at Fluent in three Months offered his ebook as ePub file, and that sold me. I want to figure out how to do this with my own ebooks. And great, important, point about accessibility. The Kindle and similar devices strike me as having great potential for many, many folks with limited vision — older people, for instance, or even small children who’re still learning to read. Yeah, I agree! Some PDFs are designed specifically for viewing on a computer, so they don’t work at all on the Kindle or you have to do that yucky zooming in/moving around thing. I’m trying to solve this by offering a landscape PDF (designed for computers/tablets, pretty, bright colors), printer friendly PDF (just text, portrait alignment), & a .mobi file for Kindles with the ebook that I’m doing. If by pretty bright colours you are refering to the text you do need to be aware that the colour blind may not see the difference between the text and the background. My Dad was in technical publishing and could not see the difference between black ink and red ink which made his job difficult. I’d like to believe the whole stigma of self publishing is behind us. I’m a fan of Joanna’s podcast, as well as a few other podcasts focused on writing and one common theme I see is that you can publish a quality book without a traditional publishing house or even an agent. For me personally, that’s the main reason why I’m excited to be living during this era: gatekeepers across many industries are being left in the dust as people figure out ways to share their genius outside of the traditional channels. It’s only since the advent of widespread internet connectivity, plus easy-to-use software (like Blogger, WordPress etc) that everyday folks (like me!) have been able to publish their writing in any meaningful way. Honestly, I think self-publishing will have both higher and lower standards. Some people will sell that, honestly, should’ve paid an editor for a serious run-through of their novel. However, people like Joanna (whose blog and Twitter I follow and love) hold themselves to higher standards. I think they’ll stick out of the crowd a little more, but I’m not so sure it won’t be any different than traditional books; I mean, look at Twilight. There are dozens and dozens of books written ten to a hundred times better, but that series sells for a different reason and because of a crowd that doesn’t necessarily care about grammar or formatting or even typos. I think it’ll be the same with ebooks. Honestly, I think you should definitely self-publish. This would definitely be the time. Great information, great post. Will be reading more from you, that’s for sure. I personally find that poor editing is REALLY distracting from a good book, and pretty much kills a mediocre one. But I agree – there’ll be plenty of material (especially at lower price points) which finds an audience despite not being very polished. I don’t think that’s a problem, it just wouldn’t be right for me. Whatever option you choose is fine with me as long as you are okay with your decision. I also want you to know that it is now necessary for you to get your book published. Right now, it does not really matter what option you choose as long as your book gets published. I think that should be your focus–getting your first book published and getting your name out there. The rest will happen in its own, sweet time. You are still quite young and this is the time to take advantage of opportunities. Once your first book is published, you have the bragging rights and the ball will be in your court. Once you become a success, traditional and mainstream publishers will come to you, asking you to please sign that book deal. If you have a lemon, make lemonade. If you play your cards right, sky is the limit. As always, I am here to be supportive and wish you the best in your creative efforts. Cheerio. I’m in two minds about this! I mostly agree with you – it’d be better to get the book out there rather than do nothing – though I also think that publishing something sub-par could knock me back a bit in the eyes of the writing/publishing world. Thanks for such a well-balanced presentation of publishing trends and a strong argument for self-publishing. You’ve convinced me that perhaps the time has come to cast off the chains of the big publishers and look toward indie presses or, self-publishing. I seems things have changed a bit in the last couple of months. I commented here about self publishing and although there were no put downs from others, it was clear that the traditional way was “the” way. I agree with Joanna Penn. I hat begging. Never been one to go with the establishment line. Much to do with growing up in the 60’s I guess. I now have two books up on Amazon and Kindle. Am I a millionaire? No, but I’m not waiting for some agent to bless me either. Here in the UK, this Christmas was probably the time when the Kindle really broke into the mainstream — so I’d agree that things have changed in the past couple of months. Great post! Totally agree, the opportunity is there for aspiring writers to make their mark even without the huge marketing machines behind them. I’m pretty sure in this ultra-connected age that any well written work will find an enthusiastic readership somewhere, it’s just a matter of getting to them. We’re launching a new social community for writers to upload and sell their unpublished work, and receive 60% of the cover price. They’ll get valuable ratings and reviews on their work to help prove and improve their writing. A new interactive relationship between writers and readers! Enjoyed your article – power to the writers! I have gone full circle. My first novel started as a POD; subsequently I was fortunate enough to be picked up by a traditional publisher in the UK. It is currently in hard cover. However, I returned to the “Indie” side for my second novel. No doubt, there is a built in legitimacy with traditional publishing, especially in hard cover. Unfortunately, for me and my novel it simply did not work out. I had a good editor so the manuscript was clean: my traditional editor (also quite good) was mostly engaged in changing American slang to the Queen’s English. The most apparent difference was the cover. While it may be true you can not judge a book by it’s cover; it is equally true you can not expect to sell a book with a bad one. My POD cover designer (provided by POD publisher) was not good; in fact she was almost hostile. Her product was terrible and amateurish; I finally accepted it so I didn’t have to communicate with her anymore. The cover design from my traditional publisher was fantastic. HOWEVER; it (IMO) deliberately mis-lead potential readers. My book is a novel based on an actual event (historical fiction); the publisher (history is their niche’) added a date and nowhere on the cover was any reference to the book being a novel or fiction. I had to fight to get “novel” included on the inside flap. I pointed out repeatedly it would kill sales; being right was no consolation. This is a microcosm of the difference between trad/indie and involves just the cover. When my traditional publisher refused to even consider the electronic spectrum I asked for release. For my second novel I have taken complete control: from cover design through marketing. I do hire experts to put my concepts/ideas into action. Editing is key. One thing that has remained an absolute constant; whether publishing traditionally, POD or epub, is that for marketing, you as the author, are on your own. There will be no support. Marketing will determine whether your novel is a success, financially, or not. As an analog man trapped in a digital world I have had to force myself to “re-train’; it is what it is. Don’t get me started on agents, that, was a real nightmare! Leland, thanks for such a comprehensive and interesting comment! It’s great to hear from people with experience on both the traditional and the indie side of the fence. Great point about marketing; I’ve heard this time and time again from people who’ve had traditional deals — it really is up to the author. If you do decide to go the “Indie” route I would suggest checking out smashword (I am in no way affiliated with them except as a user). Smashword is an e-book distributor that only makes money when you sell books; they get a percent. You can upload quite easily with a word.DOC manuscript (DOCX does not work); however to get distributed across the e-world spectrum from apple ipad/pod to Kindle etc, you must get premium status. Premium is also free, but the formatting has to be exact. I’m not computer savvy enough to fix formatting issues so I hired one of the suggested for-matters (in-expensive). I would suggest starting with an expert, get the format set and then uploading it (it will save a step). Smashword is one stop shopping for most end users/devices. It will also give you a web page, again free. Your cover needs to be at least 600 pix. I am also experimenting with a new company (minno) on my site http://www.project7alpha.com by selling each chapter for .25 (twenty five cents). By teaming with an emerging company (they provide new customers with $2.00 to play with) I’m able to market with them, advertise my first 8 chapters free and still get paid for them. It is through a Facebook interface so I run cheap ads as well (on FB). As I said before marketing is key, I hate it, but that’s life. The goal is to build a faithful readers base so that you can write more and market less. No doubt it will never go away unfortunately. Don’t get me wrong you, have to start with a good book, it should be your total focus until it’s complete. After that….. you must swim with the sharks. Good luck. Cheers Leland, I’ve come across Smashwords, have heard lots of good things and fully intend to use them… 🙂 Thanks for the tips, too. I’m OK with formatting things (I’ve worked with HTML & CSS) but may hire someone if it proves to be too tricky. Good luck with your 25 cent chapters; sounds like a really intriguing model! Hi Ali. Hope you’re good. Really interesting post. It’s great to see motivated indie authors going out there and doing it for themselves, isn’t it? I look forward to more stories and examples of this in the future. There’s some articles on our blog which hopefully will be of use to aspiring authors and indie alike – more coming soon. (You can get to the blog by visiting our main page). Ali; fully understand the need to focus on the “words”. I have found that dividing the requirements into two entities, with separate motivations helps. Most would not differentiate between writer and author; I do. My duties as a writer are strictly defined as writing and editing. Author duties on the other hand, must deal with agents, publishers and now as an indie, the entire spectrum of the industry. My biggest problem is patience; I have little. So the writer must slow the author, otherwise the words will suffer. For example; I will set down a manuscript draft for weeks. When I read it later plot holes etc jump out, “How did I get here?” The inner author will always be pushing the writer; it is a tough balance. Listen to the writer. It is indeed a tough balance — and like you, I’m not terribly patient! (Which is one of the reasons I’m now planning on self-publishing my novel: at least then it’s up to me to set the timescales.) It definitely helps to separate the writing (and editing) from the business-like bits. Ali; I wouldn’t by pass traditional publishing out of hand. There are advantages; instant legitimacy (whether you agree or not, it is a reality) has a big effect on an authors career. A “published” author does have a certain amount of gravitas. However; if you find the route untenable or constricting, then Indie is a very viable option. My point is; while it is an option, don’t close any doors. I have gone full circle for reasons listed here, but I’m still open to traditional if the deal is right. The Indie movement has drastically changed (for the good) since I have been writing. It has transitioned from “Vanity Press” to a viable option for aspiring writers. Services like smashwords etc; allow for professional editing/formatting AND listing. I would still query traditionally and then make a decision. A little patience may pay off. I’m even going to look at a list of Agents provided by The Society of Authors today. Duplicitous? Perhaps; just keeping all options open. Thanks for the extra input, Leland! I’ve thought long and hard about traditional publishing, and I certainly don’t plan on closing any doors. Right now, though, I feel that indie publishing is the best option — for me and for this particular novel. I’m very open to seeing how it goes, though, and it may well be the case that I go down the more traditional route again in future. Good luck to you, whatever option you take! I like your treatment of this subject so much. I like the fact that yóu were able to explain the subject properly and in easy to understand language and style. I’m working a new self-publishing guide book and ivee found your post useful as well. I’m sure you’ll all be able to get support from my book too.